Here's a pic of my new harp. I love it, love it, LOVE IT. Did I mention to you that I love it?? Got it second-hand. 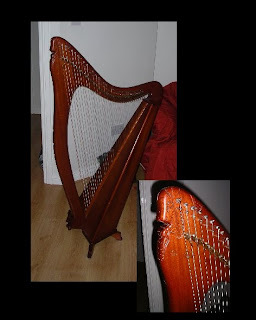 It's made by one of my favourite Irish harp makers Colm O'Meachair. He should have a website, all of his work is just gorgeous! I'll definitely be practicing more!